Getting a new roof in Colorado Springs shouldn’t be an exercise in pain and frustration. So we’ve made it easy! We’re experts in residential roofing and commercial roofing, and our warranties will provide you with the peace of mind you deserve. 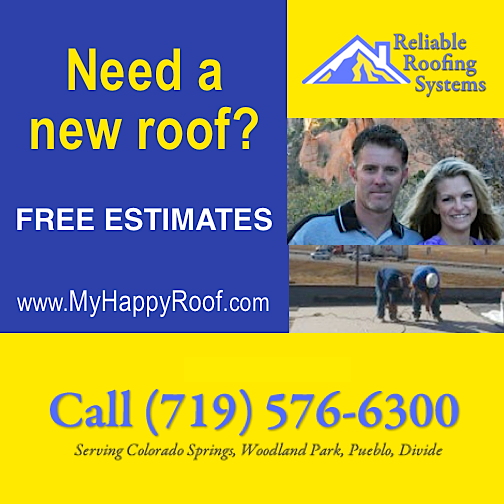 Contact us for a free roofing estimate in Colorado Springs. Our repair area includes Woodland Park, Pueblo and Divide, Colorado for roof shingles and roofing. Are you buying a home? If so, a solid roof inspection is a must. Did you know that more than 40 percent of the previously owned homes on the market have at least one serious defect? One of the most serious issues to be on the lookout for is defective roofing and/or flashings. We recommend getting a thorough, professional roof inspection before buying a house because it can save time and money in the long run. is a must. From the yard, the roof might look just fine, but our roof inspectors will need to get up there and crawl around to see if any repair or replacement is needed. Call or visit us online to schedule your inspection.